At Apple’s recent iPad event I donned my photographer’s hat. My job was to take pictures and, as quickly as possible, send website-ready images back to Macworld headquarters. Taking the pictures wasn’t difficult. The challenge lay in transferring the images from the camera to my MacBook Pro, converting and scaling them to a specific size, and then emailing them to my office compatriots. I could easily miss an important shot if I were to perform all these chores manually, so our own Jason Snell created an Automator workflow to handle the worst of the dirty work. While it may not be your job to work a press event, anyone who needs to easily transmit images—real estate agents, contractors, and doctors, for example—will find this or a similar workflow helpful. The ingredients for the workflow include Automator, a copy of Apple’s Aperture ( ), and a digital camera that can shoot while tethered—meaning that you can plug it directly into your Mac’s USB port and control the camera remotely as well as save its images to your computer rather than to the camera’s memory card. My Nikon D300 ( ) is just such a camera. Check your camera’s manual to see if it supports tethering. Launch Aperture and from the File menu choose New -> Project to create an empty project. Give it an intuitive name such as “Export and Send.” Copy a single image into this project. Now choose File -> Export -> Versions. In the resulting sheet click on the Export Preset pop-up menu and select Edit. In the Image Export window that appears click on the Plus (+) button in the bottom-left corner to make a copy of the currently selected preset. In the area to the right within this window, choose the image format you want to use (JPEG, in our case, as it’s web-friendly and the images don’t take up a lot of space) and choose a size for your images (we use 606 by 480 pixels). Give your preset a name—“Auto Export,” for example—and click the OK button to dismiss the Image Export window. Your preset’s name should now appear in the Export Preset pop-up menu in the sheet that remains. Click the Export Versions button to close that sheet. Aperture will export a copy of the image you added to the project. Launch Automator and in the template chooser that appears select Service and click Choose. 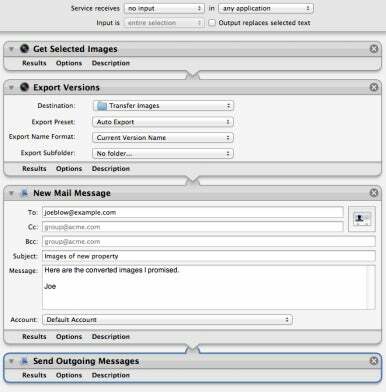 Drag these actions into the workflow area: Get Selected Images (choose Photos in Automator’s Library pane and select the action in the Actions pane), Export Versions (also found under Photos), New Mail Message (found under Mail), and Send Outgoing Messages (also under Mail). Configure the top of the workflow so that it reads Service Receives No Input In Any Application. In the Finder, create a folder and call it "Transfer Images." Drag this folder on to the Destination pop-up menu in the Export Versions action. 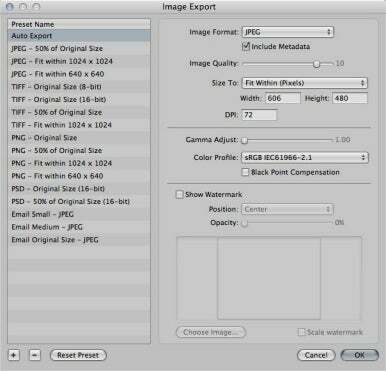 In that same action, choose your Auto Export preset from the Export Preset pop-up menu. In the To field of the New Mail Message action, enter the address of the person you want to send your images to. This can be your boss or the manager of your production team, for example. Add something appropriate in the Subject field—"Images of New Property," for instance. If you like, enter some pithy words in the Message field—“Here are the converted images I promised,” should do it. Name your workflow "Auto Export" and save it. To implement this workflow, simply move to Aperture, select any images you like, and choose Aperture -> Services -> Auto Export. Aperture will then convert the images using the settings you configured for your Auto Export preset, save them to the Transfer Images folder you created on the desktop, attach those converted images to a new email address, and then send it to the address you specified in the New Mail Message action. Adding the tethering component is icing on the cake. Select your project in Aperture. Now attach your compatible camera to your Mac via the appropriate USB cable, switch on the camera, and in Aperture choose File -> Tether -> Start Session. A Tether Settings window will appear. Leave any settings you see as they are and click the Start Session button at the bottom of the window. To take a picture either press the camera’s shutter button or click the Capture button within Aperture’s Tether window. The images you take will appear in the project pane. When you’re ready to send your images just select them within the project pane and choose Aperture -> Services -> Auto Export. Aperture will take care of the rest. When you’re ready to wrap up for the day click Stop Session in the Tether window to take Aperture and your camera out of tethering mode.